Legacy of Hope started out with just one family caring for children in their home, but it has quickly turned into multiple ministry buildings and foster homes, many employees and a great number of children loved and cared for. Throughout that time there have been just a few people here from the beginning to witness God’s glory through each transition. One of those amazing people is Miss Susy. Miss Suzy became a part of our team in 2013 as a Spanish tutor. Not only did she aid in that first task of language acquisition, but she also attended meetings with the judge in those first starting-out months in Santa Rosa. We wanted to hire her full time, but sadly we did not have the funds at the time. However, Susy didn’t completely leave the story of Legacy of Hope. She translated for trainings in Trauma Competent Caregiving for our staff and community members, and she corrected errors in translation in ministry documents. 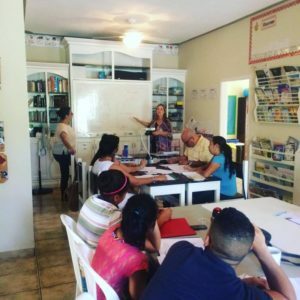 Susy also offered her services once more for Spanish tutoring when new volunteers were looking to improve their language capabilities. Susy has stepped in throughout the years in many different capacities, and we are excited to announce that with the support of a sponsor, we have been able to hire her 2 days a week to help with administration. Susy brings wonderful wisdom and cultural experience to the team. She understands all aspects of the ministry from Trauma Competent Caregiving to administration, as well as the dynamic of Americans and Hondurans working together. Flor, our administrative assistant, and many others on the leadership team are able to find rest in Miss Susy as she has been able to fill the gap in many different areas, from office work to coming alongside our staff and volunteers to make everyday tasks easier. From the beginning, Miss Susy was quite the asset to have on the team, but her importance to us has only grown–she is part of our entended family. She has watched us grow and helped us in so many different ways. Her presence during fun times and difficult times has not gone unnoticed and we are forever grateful for the ways she has bridged gaps within Legacy of Hope so that we could continue to bridge the gap for children in crisis.